Status has released releases De Fuse, a free collection of 51 presets for Hive by U-he. Owners of the Roland Aira effect modules can download now the free Aira Modular Customizer app and reprogram their devices. Moog has released the Mac OS X and Windows version of its Theremini Advanced Software Editor, which was previously only available on the iPad. Moog Music offers Theremini users an editor and librarian app on the iPad. Novation offers Bass Station II users a collection of patches created by artists. The long-awaited Windows version of the Integra-7 Editor plug-in is now available, and directly in v2. Korg has announced that they are currently working on the recreation of the iconic ARP Odyssey synthesizer from the 1970s. 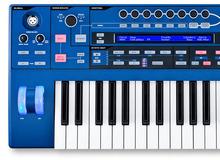 Novation offers a second pack of Supernova sounds to the users of the Ultranova and Mininova synths. Roland announces the launching of Axial website, where users of the synths of the brand will find new sounds for free.